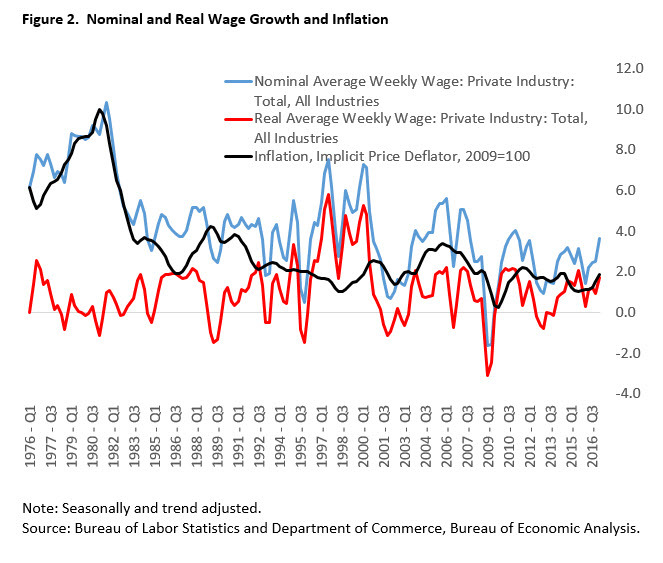 Nominal wages are real wages plus inflation. Nominal wage is measured in dollars, while real wage is measured in purchasing power. Workers care about the real wage because it measures actual purchasing power of goods and services. Firms also care about the real wage because it captures the cost of hiring labor and is determined by productivity. The phrase “inflation ate your raise” was common during the ’70s when inflation was high and obstinate. That’s why nominal wages rose at a higher rate during that time. Inflation has systematically trended down since then, accompanied by a decline in nominal wages (Figure 2). Don’t expect a big increase in nominal wages when inflation is currently below 2 percent. So how about real wages? Real wage growth peaked during the late ’90s, boosted by the surge in productivity. It has since fallen as productivity has declined. Real wages are still increasing (meaning real purchasing power is increasing) but at a lower rate than in the ’90s. Going forward, if productivity does not increase at a higher rate, neither will real wages. This will cause nominal wages to grow basically at the current rate if inflation continues to be low.